I know it has been a while since you have heard from us but there are a few wonderful events happening this September so here is a quick post to keep you up to date. We will be continuing to update this post as others are confirmed. 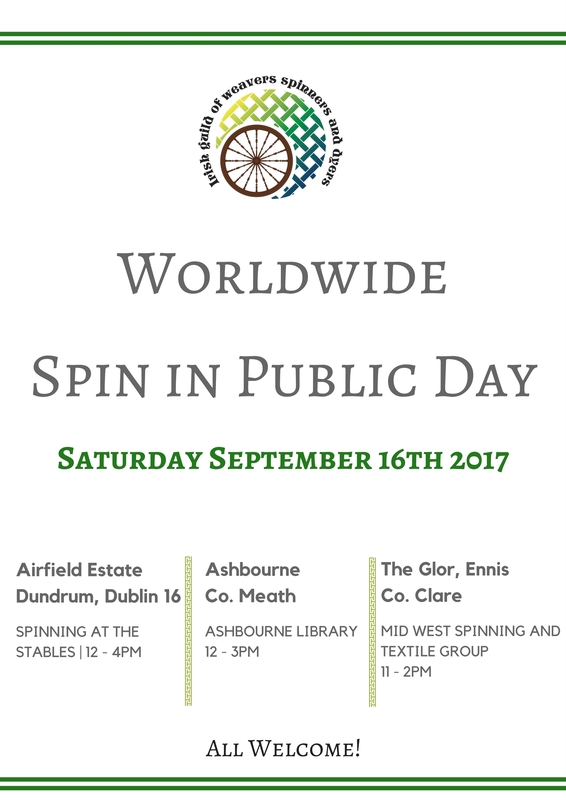 Everyone is welcome to come and visit the below locations or hold your own Spin in Public event or just take your spindle to the park for a few hours. We are encouraging groups to meet up at coffee shops or local venues even for an hour to spin and have a chat. Airfield Estate, Dundrum, Dublin 16(?) Spinning at the Stables 12-4pm. Our committee member Yvonne will be here with the new Guild folding wheel if you’d like to take a peek! This is your chance to have a chat about equipment rental and if you have never tried a wheel before you can have a look at how it works. Ashbourne Library, Ashbourne, Co Meath from 12-3pm. If you pop along to this event you will be able to meet Helen, our treasurer, and her beautiful wheel. Where: The Constant Knitter, Francis Street, Dublin 8 and also on Smithfield Square, Dublin. Alternatively just pop along on the night and have a go of the different crafts. If you’re involved in a textile related event for Culture Night please let us know, either by email or by posting the details on the Facebook group. If you want to stay up to date with everything happening with the guild why not sign up to our newsletter here and you can always add the iCalender to your Google Calendar to keep up to date with changes. You can also follow us on Facebook here or join the Facebook group for friendly chat and support. Looking forward to seeing photos from all the above events. Are you having an meet that we haven’t mentioned? Then please leave a comment below or post on one of our social channels.